Mark was interviewed by WSB for his expertise in service dog training and legislation. 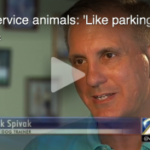 During the lengthy interview with WSB’s producer, Mark discussed federal and state laws regulating service and emotional support animals, service dog training, and his experiences with persons seeking legitimate service and support animals. He also discussed persons illegitimately attempting to avoid paying pet deposit fees or air transportation charges by posing their pets as service animals. However, as often happens with television, upon final edit only a small portion of Mark’s interview remained- the section that covered persons who contacted CPT in an attempt to abuse regulatory laws. Nevertheless, CPT was an important part of both segments of the story. The second segment featured Blue, a service dog trained by CPT for Alex Martin, a 4-year old boy with mitochondrial disease, autism, and seizure disorder. The video showed Blue with Alex while Alex’s mother Julianne discussed how Blue enhances Alex’s quality of life. 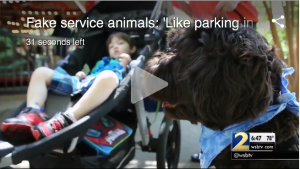 To watch the segments, please click the following link: Fake Service Animals. The segment with Blue is the first video on the page. The segment with Mark is the second video. We appreciate WSB recognizing CPT’s prowess in the field of service dog training and look forward to working with WSB’s news department again in the future. Julianne Martin and her disabled son Alex appear on the WSB news with their CPT-trained service dog, Blue.